Syngenta Foundation India (SFI) is helping Jharkhand farmers to maximize profits on small parcels of land. SFI’s network of Agri-Entrepreneurs organizes ‘co-cultivation’ of several high-value crops. Strawberries are proving particularly attractive. SFI experts conduct trials of modern agricultural practices at a Centre of Excellence in Ranchi. 125 agri-entrepreneurs (AEs) transfer the most successful technologies to nearby smallholders. The focus is on high-value crops. A recent trial of ultra-high density papaya planting helped smallholders more than double their income. This led the local Department of Horticulture (DoH) to collaborate with SFI on other crops new to the area. 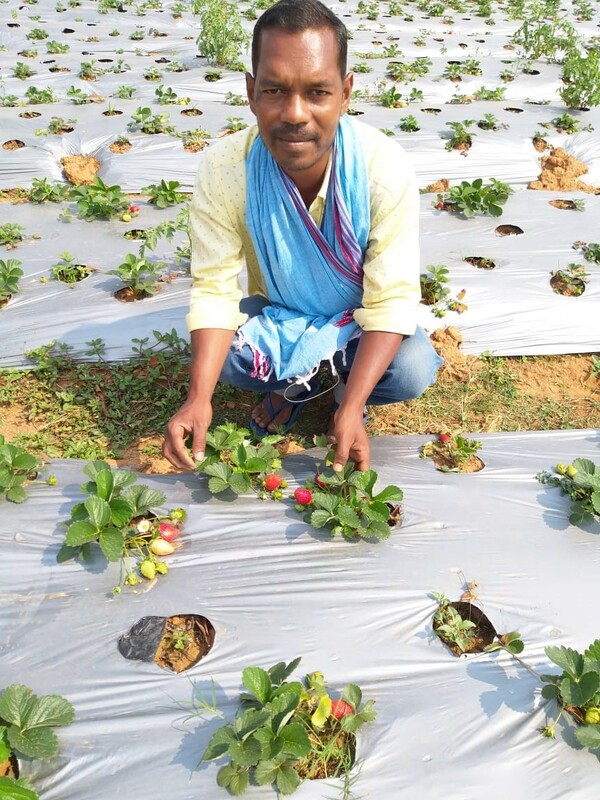 The DoH aimed to trial strawberries in Gumla District. SFI suggested that ‘co-cultivating’ additional crops would be more lucrative. Cowpea, capsicum, and papaya joined the trial as well. The trials ran in association with TRI, Jharkhand. DoH provided drip irrigation, mulching products, and plants. “Successful trialing soon led to a huge rise in smallholder income”, says SFI’s Parikrama Chowdhry. “Before, they earned about 60,000 rupees ($860) on half an acre. They are now getting 150,000 - 300,000, depending on their choice of crops.” Strawberries are a particularly profitable option. They were previously unknown in the district. "When farmers first saw the crop ripen, they were scared”, recalls Abhishek Gupta from SFI. “They had never even heard about strawberries before. Some thought the fruit could be poisonous because it’s bright red.” Abhishek and his colleague Sumit Layek persuaded farmers to work with the crop nonetheless. AEs selected the most suitable farmers for the trial. They included the man on our photo, Girdhari Singh. Together, the smallholders went for three days of education in Madhya Pradesh. Back in Jharkhand, AEs and the SFI team monitored the plots weekly and provided farmers with guidance. SFI is now extending this ‘co-cultivation’ model to other locations and is including crops such as banana.